MYTH 1: If you feel fine, you don’t have hypertension. This is far from true. More than 85 million U.S. adults have hypertension, but 1 in 6 have no idea. You can feel fine with hypertension. This is why it’s often called “the silent killer” - because someone with no symptoms can suddenly have a heart attack or stroke. MYTH 2: There’s a cure for hypertension. MYTH 3: Wine is good for the heart, so drink as much as you want. While many doctors recommend drinking red wine for heart benefits, excess alcohol consumption can be deadly for people with hypertension. It can lead to heart failure, stroke, and irregular heartbeats. MYTH 4: If you don’t salt your food, salt isn’t a big issue for you. Most salt in food isn’t added at the last minute from your tabletop salt shaker. It’s processed into the food during manufacturing, especially for canned goods, soups, tomato products, and condiments. Check labels constantly and look for words like “sodium,” “soda,” and the abbreviation “Na,” which are all variations on salt. MYTH 5: If you inherit hypertension, there’s nothing you can do about it. While it’s impossible to prevent inheriting it, you can manage hypertension with lifestyle changes. Exercise, eating a low-salt diet, maintaining a healthy weight, and avoiding alcohol and smoking can have a positive impact on your blood pressure. 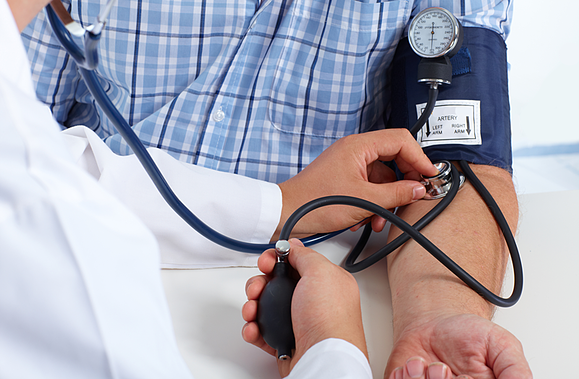 MYTH 6: If a doctor takes your blood pressure occasionally, that’s good enough. This may be true for people without hypertension, but people with persistent high blood pressure should do monitoring at home. Your at-home monitoring device should be approved by your doctor. It’s also a good idea to keep a blood pressure journal that tracks changes over time. If your blood pressure continues to rise despite medication, for example, your doctor needs to know this. MYTH 7: When medication brings your blood pressure down, you can stop taking it. Absolutely not! Never stop taking your medication without consulting your doctor. Hypertension can be a lifelong disease and you may need to take medication every day for the rest of your life. It’s worth it to protect your health. If you’re wondering whether you have high blood pressure, or coping with a hypertension diagnosis, click here to reach out to the experts at Johnson Memorial Health for more information.